So, I’m bluffing a bit because I’m not completely out of these three foundations, but I only have one to two applications left, which means they might as well be empty. I love finishing up products because it feels like a mini accomplishment. I continuously purchase new products so I feel victorious when I finally finish something up. Of course I had to do a mini review on all three bases because now that I’ve basically used them up I can tell you a bit more about them. So, keep reading for my recent empty foundation + mini review. MAC Studio Moisture Tint | Unfortunately, this product has been discontinued, but MAC has released the Lightful C Tinted Cream, which is supposed to be the same, but with the addition of vitamin C. I’ve repurchased the Studio Moisture Tint many times, and will probably pick up the new one. It gave good coverage and blended into the skin nicely. It’s one of those products that’s great for everyday when you’re on the go or just running some errands so you don’t want to spend too much time applying anything. It also has an SPF of 15 (the new one has SPF 30) so if you forget to put on your SPF (which you shouldn’t, but it does happen) then at least you will still have some protection from the sun. Tarte Amazonian Clay Foundation | This is a medium-full to full coverage foundation that is still very lightweight on the skin. If you’re someone who wants a full coverage foundation without looking and feeling cakey this is a great option. The consistency is mousse-like, which allows it to blend very easily. It is also very pigmented, and you really only need one layer, but you can build up the opacity if you want your makeup to look extra flawless. I like that this comes in a tube so you can just squeeze this out and don’t have to pour it out and make a big mess. The tube also keeps things hygienic, which I think is very important since this is going on your face. I will probably end up repurchasing this at some point, but at the moment I want to try out some other foundations instead. Marc Jacobs Genius Gel Foundation | This was the first Marc Jacobs product I ever purchased, and it definitely hasn’t been the last. Marc Jacobs has become one of my favorite makeup brands because his products are great and not overpriced. This foundation has a unique gel like formula that blends onto the skin very easily. It has a medium sheer finish that you can build up for a bit more coverage, but I wouldn’t say it’s full coverage. 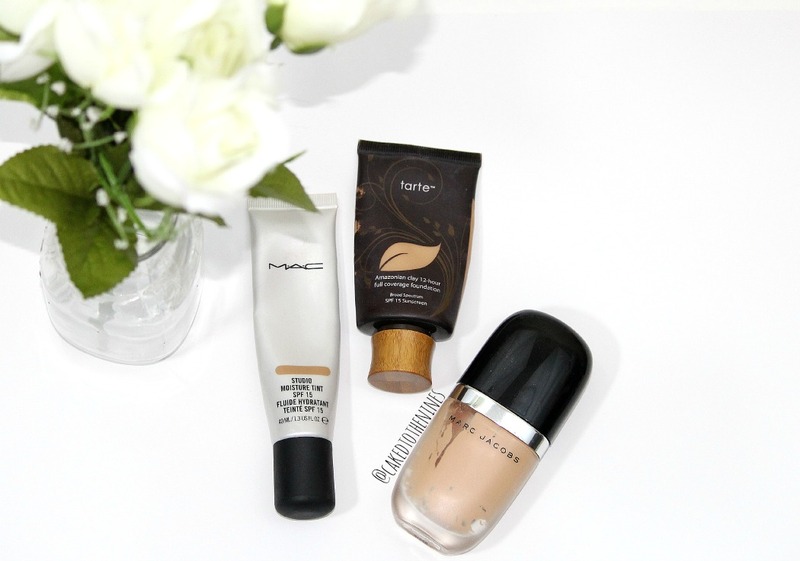 This foundation leaves your skin looking very natural and radiant, and it doesn’t look cakey. I will say that it can cling to some dry patches so make sure you do exfoliate and moisturize nicely beforehand. Overall, this was a good foundation. It didn’t blow me away, but it was a good foundation that was lightweight and left your skin looking nice. Will I repurchase this? Probably not right now because I want to try out some other foundations, but I can see myself repurchasing this sometime in the future. What are your most used foundations? Let me know in the comments below and don’t forget to subscribe for more!